Lolo Lovina ('Red Beer') is an intoxicating brew infused with Unza, Swing and Balkan Gypsy beats. Fronted by Australian born Hungarian Romani- Gypsy singer Sarah Bedak. Lolo Lovina`s music reflects the cosmopolitan identity of an artist, who grew up with three native tongues and cultures. The charming and passionate performance of their charismatic singer makes each concert a unique experience. 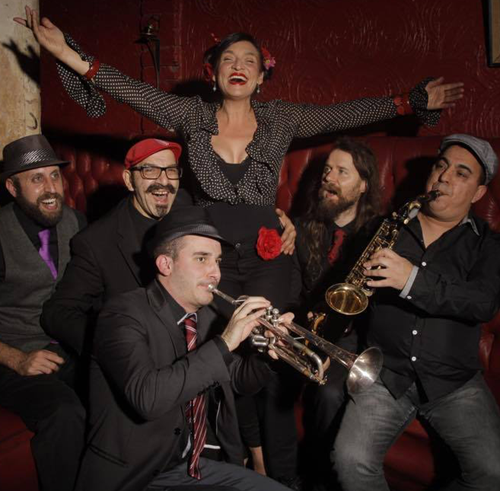 Featuring husband Nenad Radic as drummer and guitarist, David Carr on guitar and banjo (Syd), Nathan Gatt on double bass (Syd), Stefan Nocevski on trumpet (Melb.) and Muharem Sulejman on sax (Melb). Lolo Lovina have played at the Opera House, in New Caledonia, Macau, across Europe and to full houses wherever they go.